Choosing an oil skimmer best suited for your application will maximize oil removal while minimizing capital and operational costs. The impoundment capacity, shape, and location of a tank and water impoundment are major factors in choosing the right oil skimmer to lower your costs. It is critical that oil in the water is given the opportunity to separate. Oil and water can emulsify when subjected to turbulence and other mechanical agitation. Avoid this by having water return to the tank below the liquid surface at as low a velocity as practical. Make sure your tank or sump provides quiet areas, weirs, and sufficient volume to allow adequate time for oil/water separation. Tanks without nooks and crannies for oil to get stuck in are best. If you have an irregular shape, put the oil skimmer where the largest amount of oil accumulates. Consider a means of directing oil towards the oil skimmer such as a floating boom or baffle plate. Does skimmed oil need to be pumped from the oil skimmer to the container? Will oil skimmer access for periodic maintenance be a problem? How much mounting space is available? Are tank or container modifications required? If you need any help choosing the right to put a skimmer, our experts are ready to help. Give us a call at 1-440543-7400 or to learn more about which skimmers work better in specific tanks or sumps, click below. Oil Skimming Myths Exposed! Get the Facts and Real Tips! Oil skimming makes use of the differences in specific gravity and surface tension between oil and water. These physical characteristics allow the belt to attract grease, oil, and other hydrocarbon liquids from the far side of the tank. When selecting an oil skimmer, be sure to place the skimmer where oil is already gathering. This will ensure the quickest removal of the oil. Belt oil skimmers and oil skimming will collect all types of oil including all free-floating oils, LNAPLS, DNAPLS, and some emulsified oils. The various belt materials allow for any type of hydrocarbon removal. 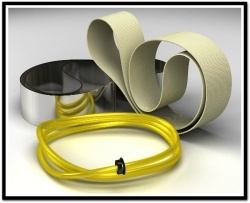 There are several things to consider when choosing a belt for your oil skimmer. For example, some plastics won’t stand up to heat or strong chemicals, some metal belts won’t skim well from coolants due to rust inhibitors being present and certain plastic belts don’t last in heated applications. It is very important to choose a good oil skimmer vendor that offers a wide variety of belts to handle any situation. Equally important is to inform them of the details of your application so they can provide assistance in choosing the proper belt material at the start. 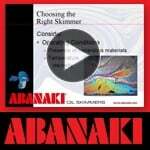 Get the Abanaki Interactive Oil Skimming Selection Guide to find the right skimmer for you. A belt is to a skimmer like wheels to a car’s chassis: although the latter is the most identifiable part, it needs the former to actually run. Just like tires, belts are not one size fits all. Just as there are snow tires, street tires, year-round tires, and more, so too are there a variety of belt materials. So what purpose does each serve?